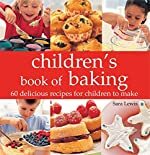 Kids' Baking: 60 Delicious Recipes for Children to Make by Sarah Lewis. Review: Step 1: Open up your book. Step 2: Follow the instructions. Step 3: Take your delicious treat out of the oven! Kids' Baking by Sara Lewis has 60 delectable recipes that anybody can make. From cakes to cookies to more cakes to brownies and bars and bread, Kids' Baking has it all! There are tasty triple fudge brownies that will make your mouth water. There are so many different options to choose from. All the recipes look so scrumptious that you will want to bake them all! The cakes all looked really appetizing. I had so much fun reading Kids' Baking. I love all the different types of food I can make. I wasn't expecting to have bread in the book and the bread looks really good. I actually made one of the recipes. It was really easy and simple to make and the outcome was delicious! Everybody loved them. They baked really quickly. This book is targeted for age's 8- 10 but anybody can make these recipes. Some are more difficult than others, but overall the recipes are fairly simplistic, which is good for the targeted audience. But, even so, anyone who loves to bake will enjoy Kids' Baking! We would like to thank Media Masters Publicity for providing a copy of Kids' Baking: 60 Delicious Recipes for Children to Make for this review. Have you read Kids' Baking: 60 Delicious Recipes for Children to Make? How would you rate it?